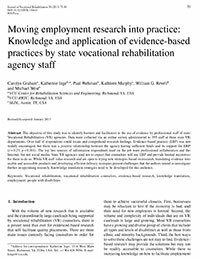 Abstract: The objective of this study was to identify barriers and facilitators to the use of evidence by professional staff of state Vocational Rehabilitation (VR) agencies. Data were collected via an online survey administered to 355 staff at three state VR departments. Over half of respondents could locate and comprehend research findings. Evidence-based practice (EBP) was not widely encouraged, but there was a positive relationship between the agency having sufficient funds and its support for EBP (r = 0.27, p = 0.001). The top two sources of information respondents used on the job were professional collaboration and the Internet, but not social media. State VR agencies tend not to expect that counselors will use EBP and provide limited incentives for them to do so. While VR staff value research and are open to trying new strategies based on research, translating evidence into usable and accessible products and developing efficient delivery strategies present challenges that the authors intend to investigate further in upcoming research. Knowledge translation strategies need to be developed for this audience.